Love Sugar Magic: A Dash of Trouble, by Anna Meriano (Walden/HarperCollins, January 2017), is a classic book of what happens when a kid stumbles into magic, tries to use it for good, and things go horrible wrong! (I'm thinking classic as in Edward Eager here; his characters would enjoy this one very much). Leonora Logroño's family owns a lovely bakery in Rose Hill, Texas, but eleven-year-old Leo is considered too young to help, even when the bakery's busiest day, the town's Dia de los Muertos festival, comes around. 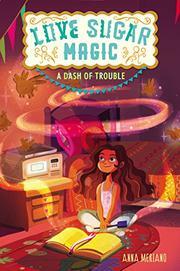 Determined not to be left out again, she sneaks out of school and down to the bakery, where she learns what's really going on without her--her four older sisters, mother and aunt are brujas (Mexican magic users), who can imbue their baked goods with magic! Leo is now even more determined to be part of things, and so when her best friend Caroline has a problem involving a close friend, a boy, who was unkind to her, Leo decides to see if she has the gift for magic too! She does. But of course she lacks any experience, guidance, or understanding of the implications of the spells she finds in the family's recipe book of magic baking. And things go wrong in that special horrible embarrassing middle school way. More magical backed goods later, things are even more wrong, and now Caroline's friend is only a few inches high and hanging out in Leo's old doll house. Leo has reached the point where can't fix things, but fortunately her family rallies around her, and with both understanding and forgiveness, helps her sort things out. Full of humor, friendship, and strong, loving family ties, as well as delicious baked goods (recipes included), this is a total charmer! The recipes that Leo finds are in Spanish, which aren't translated; Leo herself is not fluent in Spanish, and so her own efforts to understand them help the non-Spanish reading reader with no loss of momentum. And not to worry if you don't know Spanish-three of the recipes (though without the magic) are given in English in the back of the book! Give this one to young bakers, young readers who love the intrusion of magic into the everyday world, and those looking for windows or mirrors into the of a Mexican American family who are both ordinary and extraordinary! Read it yourself if you love Edward Eager as a kid! I was left with one unanswered burning question though--if you make flying pig cookies that really fly, do you eat them, or just let them fly around until they become crumbs? Kirkus more or less agrees with me, giving this one a starred review. I've seen a bit of this book around Twitter; this is the first review I've read. Sounds like a fun and cozy read. It is! Even though things go wrong, it's all ok in the end! I adored this one: it was the book I would have wanted when I was the target audience's age, but I'm happy to have it now. I wondered that about the flying pig cookies, too--it seems wrong to eat them somehow?! Sounds like a really interesting book, now I'm wondering about those poor flying pigs. Hope I can get to it soon. I've seen this around and it got good reviews. You've got me intrigued. My daughter would have loved those flying pigs. I've been wanting to read this since I saw it was coming out! I just love books that combine food and magic! I'm also excited about this one, which I hadn't heard of before now! I just got this book in the OwlCrate Jr. Box, so I'm excited to see a good review of it.